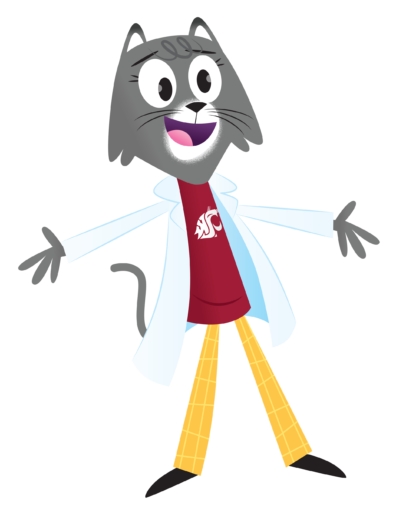 University Communications Network > Ask Dr. Universe > Why does caffeine make us stay awake? You’re right, caffeine can help us stay awake—but only for so long. To understand exactly why it works, it helps to know about one of my favorite things: sleep. All animals need rest to stay healthy. But sometimes humans don’t get quite as much sleep as they need. They might be tired during the day or have a lot of work to do. To feel more alert, they might drink a cup of coffee, tea, or soda. These kinds of drinks contain caffeine, a chemical and stimulant that can trigger changes in the body. Caffeine can make people feel excited and happy or even a little sick and jittery. We can trace all of these reactions back to our central nervous system where our nerve cells regularly interact with different chemicals, or molecules, in our body to help us think, feel, and sense our world. Each day, your body produces a chemical called adenosine (ah-den-o-seen). It can slow down activity in the brain and is part of what makes us sleepy. The chemical helps send a signal to the body when we need sleep, which helps the body recharge. Part of the reason you feel tired is because the adenosine molecules you made have actually reached parts of your nerve cells called receptors. A receptor is kind of like a keyhole. The adenosine is kind of like a key and it can unlock your sleepiness. But sometimes an imposter molecule comes along. 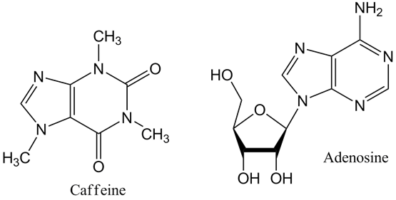 To your neurons, the caffeine molecule looks a lot like the adenosine molecule. That’s what I found out from my friend John White, a pharmacy professor at Washington State University who knows a lot about how caffeine works in the body. The reason we don’t feel tired when we have caffeine is because caffeine literally blocks the adenosine from reaching our cells and doing the job of making us sleepy. Caffeine may give us a temporary feeling of being awake, but it also has some other side effects. We might feel more nervous, have difficulties breathing, or a faster heart rate. It turns out, humans aren’t the only ones that can feel the effects of caffeine. A few scientists have studied how some bees get caffeine from the nectar in flowers. In nature, we find caffeine in plants, but we can also make it in a lab. Humans have used caffeine throughout history, but it wasn’t until about 200 years ago that a chemist named Friedlieb Ferdinand Runge took a much closer look at the chemical. Caffeine is a molecule made up of building blocks, or atoms, like carbon, hydrogen, nitrogen, and oxygen. When these elements are arranged into the molecule caffeine, they have the unique ability to kind of trick our bodies. Even if we are craving sleep, we still feel wide awake. Speaking of sleep, I think it’s prime time for a catnap. « How is chocolate made?